Roman is known around the world as the human-canine relationship coach who changes lives, who guides dog owners to finally solve even the most complex challenges, and whose intuition and unique holistic approach blows people (and dogs) away, even in the very first session. In fact, he guarantees it. Roman gives owners tools to understand canine ethology and improve their relationship with their dog, using scientific methods and his intuitive gift. Are you struggling with your best friend and about ready to give up? Tired of "trying everything" and still not getting results? Are you ready to end the struggle and finally enjoy a loving and easy relationship with your dog? Then you should work with Roman. It's unlike anything you've ever experienced. In fact, most clients solve even the toughest issues in about five sessions. (We know what you're thinking, perhaps something like, "My dog needs a lot more help than that!" But it's true. Even the toughest issues, in about five sessions.) Want to see for yourself? Schedule a short* in- depth phone consultation to discuss your needs. Whether it's a new or old problem, aggression, disobedience, or seemingly crazy behavior, Roman's unique approach gets to the heart of the matter in the first session, and then trains YOU to reprogram your dog's understanding of the world, which leads to the behavior you wish for, without the constant struggle. Change happens naturally and quickly. Roman is known around the world as the human/canine relationship coach who changes lives, who guides dog owners to finally solve even the even the most complex challenges, and whose intuition and unique approach blows people (and dogs) away, even in the very first session. In fact, he guarantees it. Read what other happy dog owners have to say HERE. Romans unique coaching method works with any dog, no matter what breed or gender. It balances the dog's mind body and spirit, and gives you the tools and the knowledge to address complex behaviors that 90% of the time are based on simple relationship issues, miscommunication, and unclear job description. 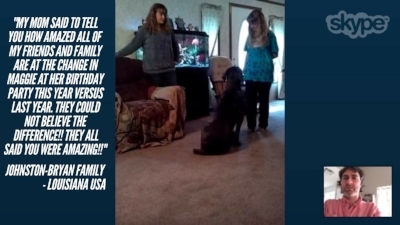 Jared Horne from Alabama, is a Great Pyrenees owner that was struggling with his dog aggression issues. After several unsuccessful attempts with different local trainers, Jared decided to contact contacted National Great Pyrenees rescue and surrender the dog. The well organized rescue, having experience with the effectiveness of Holistic Training Methods recommended to contact me and schedule an evaluation. Watch the video to see and hear how Jared transformed his dog in just 5 sessions with the Strong Bond Online Training System. Success comes when your solution is designed for YOU... your dog, in your home, in your life. 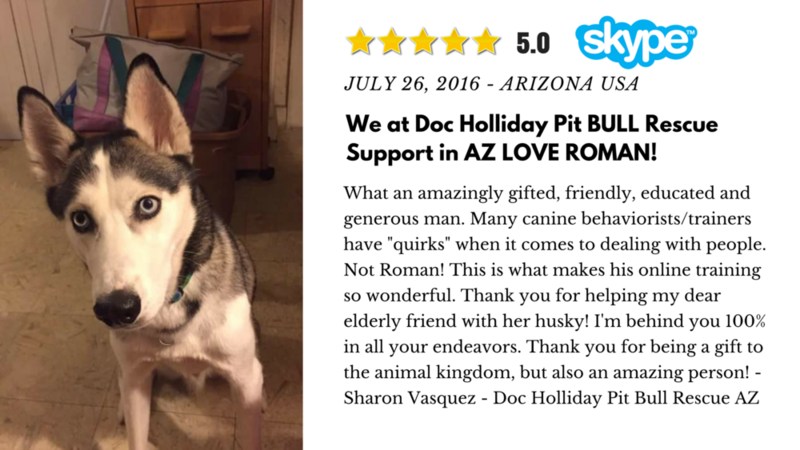 This is what makes Roman's Holistic K9 Training effective so quickly, and enables him to change the lives of so many dogs and their owners around the globe, simply by using a unique and easy to learn approach. From anywhere in the world, you can end the frustration and discover a new relationship with your dog, by just using your smart-phone, tablet, or computer. Imagine, in just a few sessions (either online or in-person), YOU can be your dog's best friend and trainer. Ready to work with your dog? One or two in-home sessions are usually enough for Roman to address 85% of behavior issues. 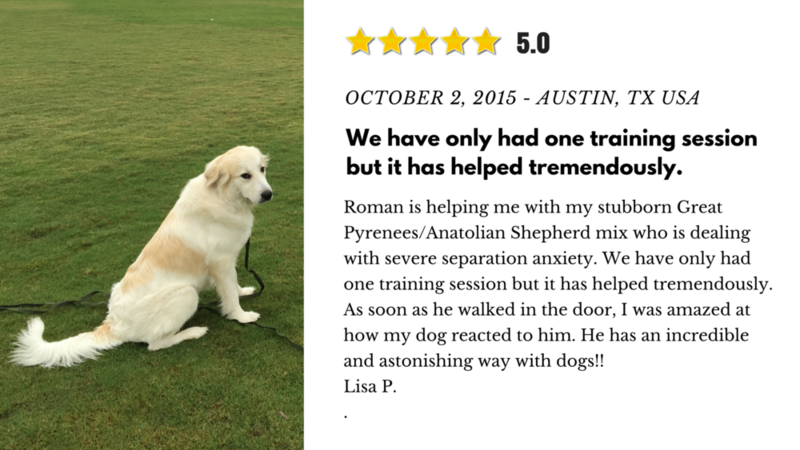 From barking at the door, leash pulling, digging, or coming when called, Roman will help you achieve your goals with force free, pain free science-based methods. Your dog will be calmer, understand his job and be a better behaved and happy family member. Become your dog's best trainer. This is the best solution to address 90% off complex behavior issues in your home. In just five weeks, you'll enjoy a transformed, better behaved dog. Results guaranteed**. **) If the first session does not improve your dog's behavior you get your money back. Also your discounted price is guaranteed for life. Time can be crucial. In a short 20 minutes Laser-troubleshoot consultation, Local or far this is a great way to get instant help with your dog's behavior. Roman will help you understand dog's struggles, identify the root of this particular behavior and discuss with you a training plan to solve one behavior problem. Become your dog's best trainer, from the comfort of your home. In a 45 minute Online Consultation, Roman will explain step by step what to do by showing you how, watching your interaction with your dog, then teaching you to teach your dog what you learned. This way your dog will see you as the only source of information. You will remain in your parenting power and your dog will love you even more. In just five weeks, you'll enjoy a transformed, better behaved dog. Results guaranteed*. Are you a Dog Lover and want to learn more about Holistic Dog Parenting or train your dog on your own? I'm sure our dog would love that! 101 with your dog is the most rewarding learning experience. FB, Youtube, TV shows are most popular ways to get more knowledge about dogs and training but finding the information you want is difficult, because they only give you so much that you are forced to hire them or it does not work. This is why found a way to offer you high quality information by being still available when ever you need it. Join my closed Facebook group and learn from others and share your passion. Dominance (Alpha) theory doesn't work. This has been proven. Dr. L. David Mech (the inventor of the alpha theory) talks about the terms "alpha" and "beta" wolves and why they are no longer scientifically accurate. Watch the video to the left from the creator of alpha theory Dr. L. David Mech. In fact, it can create other, even bigger problems down the line. Approaches we see on TV are generic, highly edited, and don't take into account your dog's unique breed, history, home environment, emotional needs and genetic needs, all of which make up his understanding of the world. Until this is clear, attempts at placing "right behavior" on him will bounce off like a rubber arrow. In his studies Dr. Mech explains:" With captive packs there are contradictory claims regarding the dominance roles of "alpha males" and "alpha females" in relation to each other and to subordinates. This issue also relates closely to the concept of leadership but is not necessarily the same." - Asa, C. S., Mech, L. D., Seal, U. S., and Plotka, E. D. 1990. The influence of social and endocrine factors on urine-marking by captive wolves (Canis lupus). Horm. Behav. 24:497-509. Dogs are emotionally intelligent. The Best way to train a dog is to have the dog do things on his own free will. Force creates resistance and when your dog resists that puts the dog in a uncomfortable position. The Best way to train a dog is to have the dog do things on his own free will. Force creates resistance and that is not helping the dog. Subscribe to hear the latest Podcasts about dog training, behavior modification, relationships and behavior troubleshooting tips.